After a grueling day at the Joint Training and Training Development Center, the Jets landed at Joint Forces Headquarters- New Jersey on May 14. 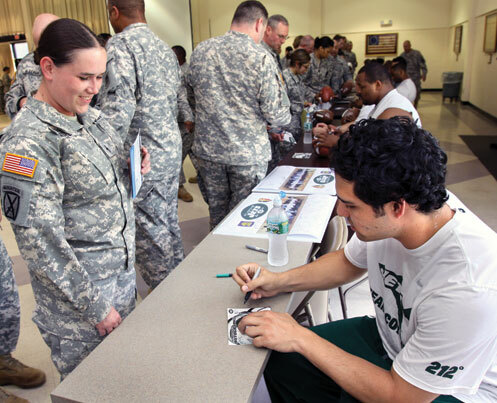 Here Warrant Officer 1 Katherine Bendel, left, watches as Jets Quarterback Mark Sanchez signs an autograph for her. All 65 Jets team members signed autographs and posed for pictures with the Soldiers, Airmen and family members. Photo by Tech. Sgt. Mark Olsen, NJDMAVA/PA.